Should Minority Schools be Exempted from the Right to Education (RTE) Act Norms? In this blog, I argue that the critique of the judgment is well founded and there is no convincing justification to exempt minority schools from the 25% reservation regulation. Abstract: The accepted wisdom is that private schools serve the privileged; everyone else, especially the poor, requires public school. The poor, so this logic goes, need government assistance if they are to get a good education, which helps explain why, in the United States, many school choice enthusiasts believe that the only way the poor can get the education they deserve is through vouchers or charter schools, proxies for those better private or independent schools, paid for with public funds. Should minorities be deprived of quality education? New Delhi: A Supreme Court judgment holding that the RTE Act guaranteeing free education to children from socially and economically-backward sections is not applicable to minority-run institutions is not finding many takers in the legal fraternity who feel it is flawed and would deprive hundreds of thousands of children from vulnerable sections of quality education. In this part of a series on constituencies that have improved on social indicators, The Indian Express visits Ghazipur, where the number of schools has increased but the quality of education has not improved. DUBAI: A local charity is aiming to improve education for more than 1 million schoolchildren in India over the next three years. India has no strategy for technology in the classroom, but entrepreneurs and nonprofits are braving the odds in the sector. Right to Education fees refund on track: Govt. PUNE: State education secretary Ashwini Bhide was in the city on Friday for a review workshop of Pune, Kolhapur and Mumbai divisions. Bhide spoke to TOI on the workshop's sidelines on a range of issues including reimbursements to schools for Right to Education (RTE) admissions, continuous and comprehensive evaluation of school students and mushrooming of play schools in cities. Here's what's behind the claim that education is the panacea to inequality -- and why it has the answer all wrong. 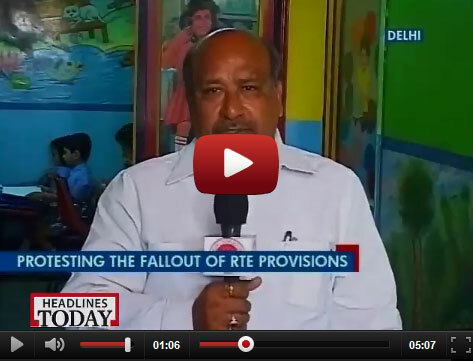 Should the RTE Act be applicable to minority schools? RC Jain said that many schools in India will not be able to fulfill Centre's land norms and will shut down, bringing lakhs of children on roads. Watch this video here.